The term Stewardship is most often thought of in relation to money – how members give to the church and how the church manages the distribution and spending of these funds. At Gale we understand that giving will not be the same for everyone: not equal gifts, but equal sacrifice. Like the widow we read about in Mark, she did not give at the same level as her wealthy neighbours. But she gave what she could. If we look at Peter’s reference, however, we would understand Stewardship as also being the personal gifts we receive – consider the ability to teach, the ability to inspire volunteers, the ability to cook and bake, the ability to run audio-visual equipment, the ability to care for children, the ability to provide pastoral care or the ability to … the list of gifts church members bring to Gale are as numerous as the membership itself. Stewardship suggests that we give out of a desire to glorify and praise God, in thanks for the gift of life. That we give because God has given us much, in abundance. His love. His Son. His Grace. We are called to give cheerfully, not because we must, but because we want to, because to do so demonstrates thankfulness for God’s grace. They may be designated toward certain projects and set aside specifically for that purpose or forwarded directly to that organization; for example, we receive funds for PWSD, Woolwich Community Services, Woolwich Counselling Centre, and relief efforts in disaster torn countries, i.e. Philippines/Syria. Funds directed toward certain projects, such as relief efforts, are matched by PCC (Presbyterian Church in Canada) to double the given amount. A significant amount of money is sent directly to the PCC each year as general givings to support efforts that the national church decides are important. Other funds are used within our own congregation to support youth going to camp, mission trips within Canada or abroad, Vacation Bible School or to support youth activities and Christian education in general. Funds are also used to operate the church building (heat and hydro), and to pay staff including a minister’s salary. Members may choose to arrange for a specific amount of money to be automatically withdrawn from their bank account every month to be deposited directly into the church account. 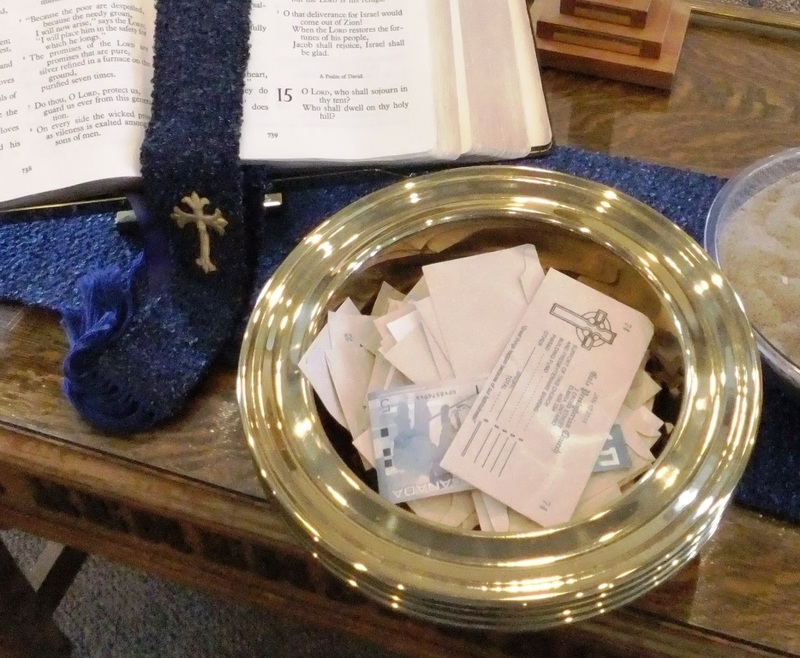 This ensures that a regular donation is made, even when a member can’t be in church. It helps ensure a regular stream of revenue coming into the church. The amount of the donation can be changed at any time. It can be stopped at any time as well. Members still receive envelopes which they can use to place into the givings plate each week and when special causes, such as disaster relief funds, are requested, a member can choose to place money in the envelope and direct it to the specific cause. Another way to donate to the church is through something called planned giving. This involves including the church as a beneficiary in a will. It can also mean naming the church in an insurance policy or donating stocks to the church. There may be financial benefits to the donor for these actions.